Size : 14.9 x 19.5 inches. / 37.8 x 49.6 cm. 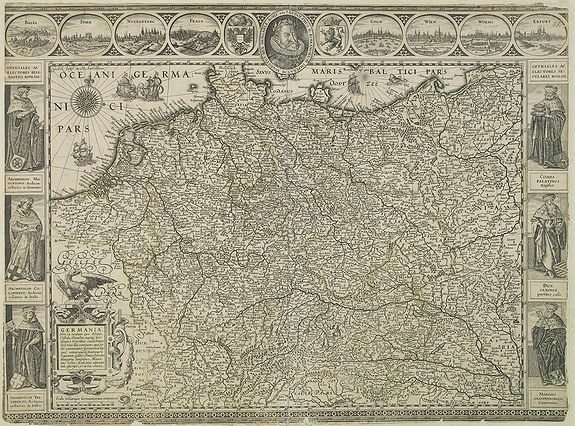 Description :Second state of this rare "carte à figures"- map of Germany, The Netherlands, Poland and central Europe. Bordered on three sides with portraits and views. In the center of the top border an oval portrait of the Emperor Rudolph II (1576-1612), on both sides city views of Basel, Spier, Nuremberg, Prague. To the right Cologne, Vienna, Worms and Erfurt. Schilder, Monumenta, VI, map 30 second state. Condition : Margins cut into outer engraved border.